Being outside with your kids doesn’t need to be expensive. Yesterday, I spent a chunk of my day tramping around the Cross Conservation Area – a beautiful piece of rolling prairie on the southern edge of the city that was set aside to protect wildlife. This is an amazing place – less than 45 minutes from my house in the Northwest (much closer if you live in the southern half of Calgary) and it feels like you’re in the middle of nowhere. Miles of hiking trails, dark skies and ample opportunities to see wildlife are here. Well worth the short little drive. One thing that I love about Canada is that virtually every city has a conservation area, a natural park or even a whole island nearby to explore nature with your kids. Why is it that we always think that we have to get in the car and drive for a couple of hours to the mountains/cottage country/beach/ocean to explore nature? I’ve never lived somewhere where nature wasn’t at my back door! Growing up in Toronto, we rolled down hills in the ravine, explored the urban forest and visited the beach all the time. In Nanaimo, we rolled over rocks and looked for sea creatures – here in Calgary, my son and I enjoy running through the tall grass in urban wild lands! It does mean that you have to be wearing the right clothing. Even that doesn’t need to be expensive. I will teach you a little secret – it turns out that fleece is fleece, even if it doesn’t say North Face. You can learn to knit hats and teach kids to knit their own. Get a sewing machine and make your own wind pantsuit me wear them over Walmart fleece pants. I bet you can build up a winter outfit for a lot less than you think. Once you’re dressed right, get out there. You’re gonna love it! I’m the first to say that a little bit of dirt in somebody’s life is a healthy thing. There are studies that show that you have to eat a bit of it to have a healthy brain and immune system. Kids have immeasurable fun experiences when they play in the dirt, because there are an infinite number of possibilities! It can be pies one minute and a racetrack the next. I love dirt! The are some many more. Tell your hipster friends! Maybe they’ll buy you a beer with the money they save! I spent the weekend with some friends in a little cabin in the woods and our kids. 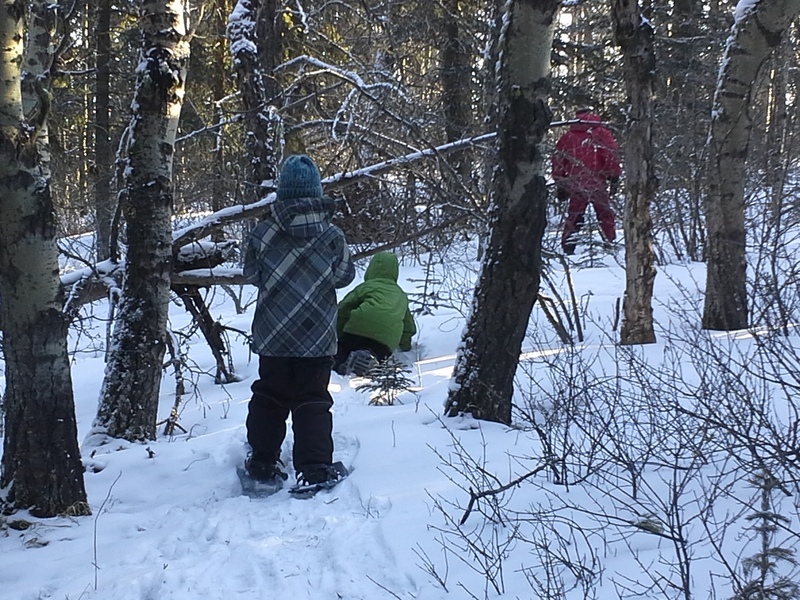 We snowshoed around the property, looking at pine cones and checking out the local birds. We saw lots of deer tracks and the places where they bedded down, but none in person. We were using rented MSR snowshoes that we picked up from University of Calgary Outdoor Cente. I’m a big fan of their gear rental service – it’s a great way to get in to the outdoors without spending a lot of money. For families without a stockpile of camping gear like I have, it’s a great opportunity to try something new and to try before you buy. I also had the chance to try something new. A friend brought along a snow saw and we spent hours cutting snow blocks that the kids used to make an incredibly cool fort. The walls were at least four feet tall and the kids had fun running in and out, even making the occasional snowball to throw mout. Mostly, they perfected the fort. Next time, we will build a campfire in front to reflect heat so that I can enjoy sitting and reading while the kids played. I’m told that the best snow for cutting blocks is from drifted snow – they’re the most solid. One word of caution – keep a close eye on the kids. Children have been buried over the years in snow forts, sometimes with tragic results. We never dig quinzees for them to play in. It’s just a bit too risky. Very few things better than playing in the snow for a few days in the winter. We’re looking forward to our next time out! Last summer, we spent a few more nights camping than we had in previous years. We discovered a few problems with our setup that I’d like to correct this year. The first was with our tent. We’ve been using a Woods many person tent that I’ve had for more than a few years. It’s okay, but lacks a full fly and, when we encountered rain this year, proved to be quite leaky. Not a great setup. So, we’re in the market for a new tent. I’ve pretty much decided on the Big Agnes Flying Diamond 6. It has great reviews and the ability to create an extra room for our son to play in quietly while we sleep in in the morning (or we can zip him in there while we read at night – creating the opportunity for his to sleep). I would love any suggestions on other options – we need a full fly, space for stretching out and quality. I used to work as a canoe guide and am still an outdoor professional, so buying poor gear isn’t an option. Speaking of poor gear, we’ve had a few air mattresses over the years and they all seem to leak – leaving us on the ground or with a poor waterbed like experience. I have some back issues and a decent night’s sleep is imperative, so we’re also in the market for a better base camp experience. Suggestions are welcome! Ideally, I would love something where I’m more than a few inches off the ground and that is at least as wide as a double bed. Finally, hauling the gear is becoming an issue. We bought a wagon this fall that has a better gear hauling ability, but I’m also scouring craigslist for a set of yakima racks and either a roof box or basket to help get stuff to the campsite. Eventually, I’d like to get some sort of trailer, but that will be for another year – I’m struggling with picking up a used utility trailer or looking at something like a soft top tent trailer (I really like what livinlite has done with their Quicksilver. For right now, though, we’ll be sticking with what we can fit in to our vehicle. Camping season is coming soon, in only a few short months I hope to be using this new gear that I will have bought. So exciting! My family spent a good deal of our spring vacation (yes, I wrote this a while back and am only getting around to posting it, sorry) on Vancouver Island and every day we visited a beach. Beaches are magical places.. You can roll back rocks, you can build forts out of driftwood and you can explore tide pools at low tide. So much ocean nature is evident when the tide goes out. Our friend Paul, a biology teacher, taught us that you should only flip back rocks the are smaller than the size of your head. That way you don’t hurt what’s underneath. He showed us pisaster starfish (they’re purple), baby eels and crabs. It was amazing! My son keeps telling people that he’s seen an eel (and, six months later, he’s still doing it!). He also loved getting his feet stuck in the mud on Parksville beach, wiggling in the soft mud up to his ankles and playing with a kite that our friend Tim was flying. I think that thing that made this so special is that we did these activities together. 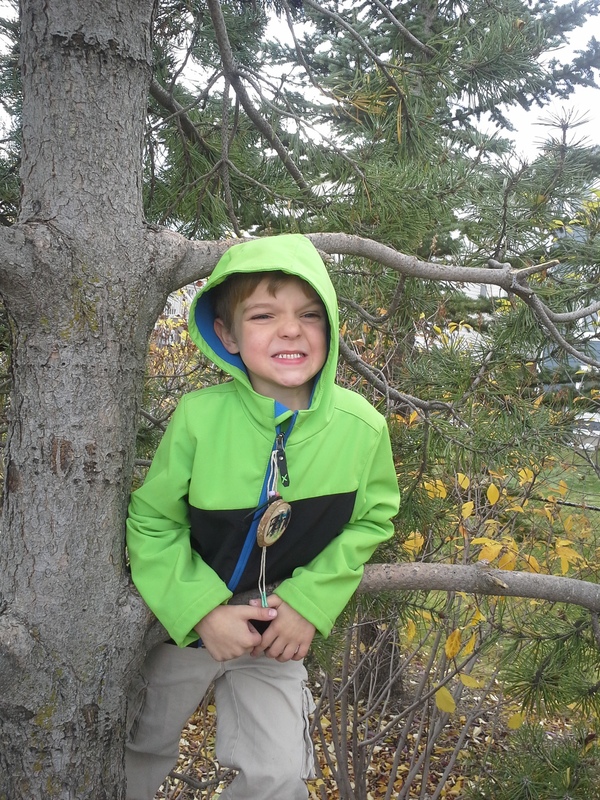 As the Child and Nature alliance has been saying over the past year “if you want kids to get in to nature, take them outside.” Kids learn by example and, if you show them that you like being outside with them, so will they! Not a day goes by when my son won’t ask me to take him outside. We’ve tried to make the indoors boring and the outdoors exciting. We can have fun in the backyard, in the forest, in the local park and, sometimes, even on a beach! Nature is everywhere and, together, we make it fun. Last week was the Children and Nature network’s Grassroots Gathering. One of the keynotes was Claire Warden. Here is a link to her talk – it’s great!